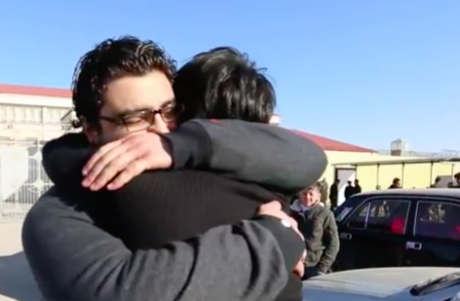 It’s easy to celebrate when Azerbaijan’s political prisoners are released. But ensnared by public stigma and personal trauma, what are the chances that they ever find a place for themselves in society? 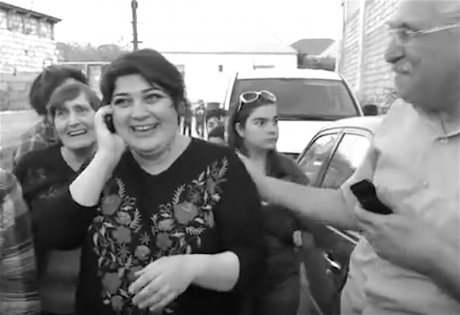 Khadija Ismayilova returns home after her release (on probation) in May 2015. In September 2015, the acclaimed investigative journalist was sentenced to seven and a half years in prison on charges of fraud and tax evasion. Image still via YouTube / Turan Agentliyi. Some rights reserved. Azerbaijan’s ruling Aliyev dynasty is tightening the screws, and last year was a new low. At the end of 2016, Bayram Mammadov and Giyas Ibrahimov, two activists for youth movement N!DA, were sentenced to ten years’ imprisonment for spraying graffiti on the statue of former Azerbaijani president Heydar Aliyev. “Happy Slave Day”, they wrote — a play on the similarity of the words gül (“flower”) and qul (“slave”) in Azerbaijani. 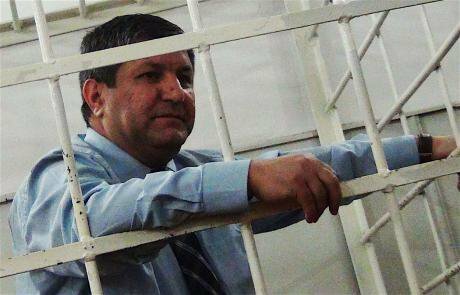 Amnesty International has recognised Mammadov and Ibrahimov as prisoners of conscience. And they’re far from the only ones. We could mention the jailed video blogger Mehman Hüseynov or the journalist Afghan Mukhtarli, who was recently abducted from the Georgian capital and sentenced on bogus charges in Baku. We could mention many more still, and hold international campaigns for their release. Sometimes, as in the case of famous journalist Khadija Ismayilova, this pressure even bears some fruit. A dissident can walk free, but their story doesn’t end there — they have few hopes of finding a place for themselves in a society as authoritarian as Azerbaijan. Repression breeds depression, and political prisoners who walk free can find themselves mired in hopelessness. If you’re once a dissident, you’re always a dissident — employers and even friends keep their distance after release. After all, it’s just easier that way. At the end of last year, Azerbaijani civil society eagerly awaited president Ilham Aliyev’s pardon list, which he’s usually given before the new year’s holidays. There tends to be a handful of political prisoners among the convicted, too. But this time, there was no announcement. Of course, it’s not pangs of conscience that prompt such moves. As the human rights activist and chairman of the Azerbaijan without Political Prisoners group Ogtay Gulaliyev writes, the regime in Baku pardons political prisoners when it needs to sweeten relations with Europe. For example, the last pardon list was issued just before Novruz (Persian and Azerbaijani new year) and included 12 jailed activists. Gulaliyev regarded it as an attempt to increase Azerbaijan’s chances at receiving an invitation to the Nuclear Security Summit in Washington in 2016. More recently, with the EU focused on migration politics and the US busy with elections (and their aftermath), Azerbaijan’s leaders didn’t see any need to show such mercy. Naturally, how well one adapts to life after imprisonment depends on the harshness of life inside, and the trauma it can bring. “Conditions in jail are quite similar to conditions outside it. The only practical difference is that you’re stuck in a cell,” remarks Tofig Yagublu. The ex-political prisoner, deputy chairman of the opposition Musavat Party, was arrested in 2013 and sentenced to five years. Yagublu was pardoned by president Ilham Aliyev in March 2016. The loss of his daughter Nargiz, also an opposition activist, struck Yagublu hard. Yagublu couldn’t attend her wedding as he was behind bars, but was released for seven days to be at her funeral (she died during childbirth in Russia in 2015). “The prisoners I met were often just normal people,” remarks Zaur Gurbanli, a N!DA youth activist. “Most of them weren’t guilty. They’d been arrested on all kinds of pretexts, like failing to pay a bribe.” Gurbanli was arrested in 2013 and released at the end of the following year. He also adds that fellow inmates rarely bothered political prisoners unless the wardens made them. Avaz Zeynalli, editor in chief of Khural newspaper, at his court hearing in 2013. He was found guilty of tax evasion and initially sentenced to nine years’ imprisonment, though his critical articles targeting high-ranking officials were widely believed to be the real reason. Photo courtesy of IRFS / Obyektiv TV. Some rights reserved. For Zaur Gurbanli and Avaz Zeynalli, prison was a formative experience that many ways has strengthened their resolve. They’re prepared, too. For many activists and dissidents of all stripes, the threat of a jail sentence is never far off. After Zeynalli’s arrest in 2011, the Khural newspaper where he worked as editor in chief was shut down. Two years later, he was sentenced to nine years behind bars, and released in December 2014 by presidential pardon. Zeynalli adds that he had plenty of time to read and write during his sentence — and even managed to smuggle out his prison diaries. “The time passed as there was so much to do, and I prepared myself for freedom,” he reflects. Celebrated academic Arif Yunus had quite a different experience. Even though he was first arrested in 1976, the ordeal was no easier. In 2014, Arif and his wife Leyla were arrested almost simultaneously. Their only daughter was abroad and could not return to Azerbaijan — though if she had, she wouldn’t have seen him. Yunus says that meetings with relatives and even lawyers were restricted. For more than a year, he lived in solitary confinement (according to reports by Juan Mendes of the UN, a person cannot survive such a condition undamaged for more than 15 days). Is there life beyond bars? Arif Yunus was released in November 2015 on grounds of deteriorating health, though wasn’t allowed to leave Baku. Adapting was hard. He couldn’t sleep at home for six days, so used was he he sleeping beneath a 15-watt light. Sleeping pills were a remedy, but he soon became dependent on them. This was a freedom for which neither Mammadov nor Zeynalli could prepare. Disillusionment with activism is just one consequence of jail time. Far more pressing is the utter lack of prospects. Last year, Zaur Gurbanli won a Chevening Scholarship and is now a student at Glasgow University. Following his release from jail, he applied for several jobs. His arrest worked against him — some employers knew exactly who he was, while others found out when he had to explain the two-year gap in his employment history. Meet me at the prison gates. Youth activist Zaur Gurbanli walks free in December 2014. Image still via YouTube / Turan Agentliyi. Some rights reserved. Mammadov tells of similar experiences. After one employer gave him a job, he suddenly left the room and told his new employee to wait for five minutes. Mammadov was then told he was no longer hired, because somebody had ordered the management to drop him immediately. He has now lost hope in finding a job in Azerbaijan, and plans to get an education abroad. Azerbaijan is in the midst of a protracted economic downturn. Educated young people are leaving the country, and nepotism is rife in filling sought-after positions. With work hard to come by for everybody, these circumstances alone work against all former prisoners, political or otherwise. While Azerbaijani law forbids former prisoners from working in a police department or as a prosecutor, it’s highly unlikely that the state officially orders other employers not to hire former political prisoners. After all, there’s no need — poor economic prospects and a stigma towards “criminals” of all kinds work perfectly well in excluding them from the labour market. When faced with such a candidate at a job interview, junior managers and small business owners alike don’t have many other choices. The ex-con may profess their innocence, blaming the state for bought courts and crooked cops. Who would you believe? In these cases, many in authoritarian Azerbaijan would rather hedge their bets with the authorities, whatever deeper misgivings they may have. This is partly due to lack of alternative sources of information, and partly a cultural predilection. As they say in Russia, vor dolzhen sidet’ v tyurme (“a thief should sit in jail”) — so if you’ve spent time behind bars, you must’ve done something wrong, whether you know it or not. After all, there has to be some logic to the way of things. Employing political trouble-makers is just a headache; the state has a thousand ways of getting back at you before breakfast. Zeynalli also stresses that known members of many political parties cannot be hired in state positions. “I have friends who are doctors and teachers who have had to resign from the Musavat and National Front parties. They still work only because they’ve joined the ruling New Azerbaijan Party.” Of course, there are those who have broken ranks with former opposition comrades with gusto -- though in today’s economic realities, “seeing the error of your ways” may not automatically lead to employment. 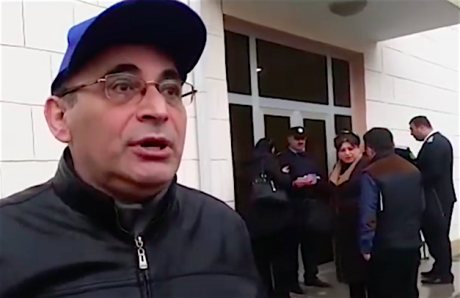 Arif Yunus gives an interview to the press after his release from jail in November 2015, on grounds of deteriorating health. Yunus was initially barred from leaving Baku after his release, and had to wait until December before the release of his wife Leyla. Image still via YouTube / RFE/RL. Some rights reserved. That also goes for business. Almost all independent companies of any significance have to have relationships with the state or with figures who do. Even a company which functions without much interference will probably not employ somebody who has publicly criticised the government. If that’s practically impossible in the state sector, it’s definitely impractical for the private sector. Employing political trouble-makers is just a headache — and from the taxmen to that new job your cousin’s just applied for, the state has a thousand ways of getting back at you before breakfast. Then there’s one final practicality — sometimes a court verdict can remain valid well after a presidential pardon. There’s no telling whether your employee will be hauled over the coals and brought before a judge yet again. When they walk out of the prison gates, Azerbaijan’s dissidents find that the children, trees and skyscrapers of Baku have grown taller. But the landscape for freedom of expression and professional advancement remains as bleak as ever, with their criminal convictions a heavy burden to bear.